“This next game we’ve got to come out and fight,” reckons Arnie – which makes you wonder why the Socceroos didn’t simply do that the first time around. 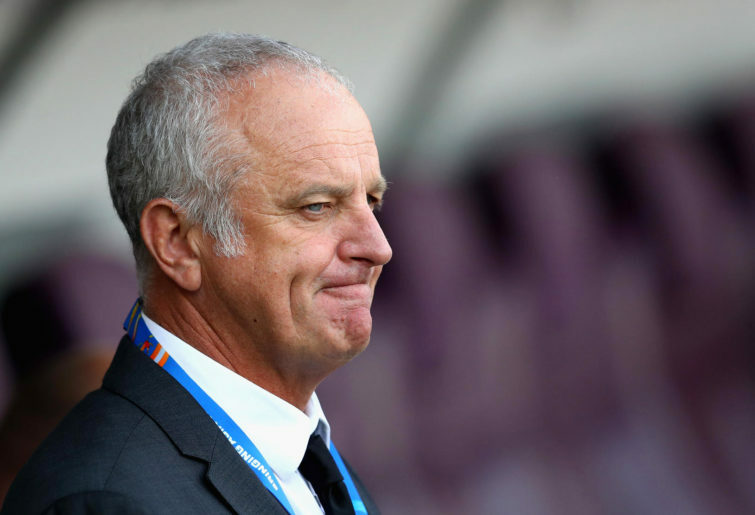 “I’ve seen the hurt after the game and I’ve seen the motivation,” Socceroos coach Graham Arnold told Vince Rugari of the Sydney Morning Herald following Australia’s 1-0 loss to Jordan. He could have added his preferred recipe for chicken tikka masala for all anyone cares, since we’ve all heard the same sentiment at least a thousand times before. Must get better, show some fight, blah blah blah. Footballers stopped trusting journalists long ago, but the same is surely increasingly true of the public and their attitude towards our footballers. There are only so many blandishments you can take before you eventually tune out and stop listening. What the Socceroos actually need to do is let their actions speak for themselves, and in doing so alleviate some of the pressure on a coach still finding his way in international football. Mind you, it wouldn’t hurt for the general public to harbour some slightly more realistic expectations for the national team as well. Social media is an unhinged bubble of hyperbole at the best of times, but you’d think Arnold had just lost the Socceroos the World Cup final by fielding a fourth substitute, such was the level of anger over Australia’s loss to Jordan. Here’s an idiom perhaps worth remembering – you win some, you lose some. One of the more tiresome aspects of the game – particularly in the online world – is fans absolutely losing their collective minds any time their team of choice suffers a defeat. We get it – you want the Socceroos to win, but what good is a #SackArnie hashtag honestly going to do? About the only person whose proclamations I’ve paid any attention to in the build-up to tonight’s must-win clash with Palestine is Chris Ikonomidis. “I felt I added energy,” Ikonomidis told AAP after his cameo appearance against Jordan – and it’s pretty clear the Perth Glory playmaker is an obvious answer to the Socceroos’ ongoing lack of urgency. It will be interesting to see what role Tom Rogic plays in Dubai – broken hand and all – after his ponderous performance against Jordan. If Rogic starts in central midfield and Andrew Nabbout is supposedly fit enough to lead the line in attack, then where does that leave Ikonomidis? Arnold can’t exactly drop Awer Mabil, after the right-sided attacker proved one of the few direct routes to goal against Jordan. He’s hardly an out-and-out striker, but surely it’s worth gambling on starting Ikonomidis at the point of attack and saving Nabbout for the final group stage game against Syria? Even Apostolos Giannou might be a better option up front than goal poacher Jamie Maclaren, given how isolated the Hibernian striker looked against Jordan. Ultimately this is how Arnold earns his salary, although his players could do him a favour and take some responsibility for their own performances on the pitch. But as the tournament has reminded us in spades over a thoroughly enjoyable group stage to date, winning the Asian Cup isn’t easy. It’s not supposed to be, and all the things that can go against a team – injuries and refereeing decisions and hostile crowds – are the sort of obstacles a champion team will overcome. That’s precisely the task that awaits the Socceroos. If they can’t beat Palestine – a team that literally personifies the phrase ‘playing for pride’ – then they simply don’t deserve to defend their Asian Cup title. But what everyone back home in Australia wants to see is a decent performance. Enough talk. If actions speak louder than words, then it’s high time the Socceroos started proving it with a vastly improved display against the Palestinians tonight.